Remember all those articles (including some on this blog) that claimed mortgage rates would have to rise to X percent in order for homes to become unaffordable? 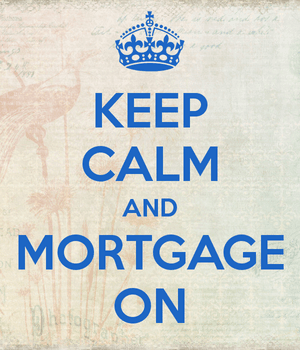 Well, mortgage rates have been pretty flat for the past several years, and remain amazingly attractive historically, yet home prices have now risen out of reach for many prospective buyers. What gives? How could this be? Well, they’re unaffordable because home prices have surged. While the housing recovery has been wonderful for those who were able to hang on through the crisis, and those lucky enough to pick up properties on the cheap post-crisis, it has left behind scores of would-be buyers in its wake. Per a recent analysis from Zillow, mortgage payments are now unaffordable in half of the nation’s 35 largest housing markets, despite those rock-bottom interest rates. Certainly this can’t be good news. They found that monthly payments for the median-valued U.S. property only require 16% of median income, which is quite affordable. But here’s the problem – the median-priced home isn’t the one for sale. The homes that are for sale tend to be priced above the median for their particular market. This isn’t just a feeling you get while perusing inventory online. In all but three of the largest 35 U.S. metros, the median price of homes for sale is higher than the median value of all homes. In short, it’s mostly expensive homes that are listed these days, not the run-of-the-mill average-priced ones. You’ve probably heard that starter homes are hard to come by. This is partially because the expected move-up buyers aren’t moving up, thanks to a lack of home equity and a low mortgage rate they don’t want to give up. So when you actually look at homes listed for sale nationwide, 20% of median income is being swallowed up. Unfortunately, that’s just the pretty picture of the nation as a whole. For many individual housing markets, it’s way worse. In Los Angeles, the typical property for sale requires 46.8% of median income, which a lender probably wouldn’t even accept DTI-wise. Prior to the most recent housing bubble, buyers in LA only needed to spend 35.2% of income on mortgage payments for the typical home purchase. To sum it up, LA buyers have access to some of the lowest mortgage rates in history, yet need nearly half their paycheck to cover the mortgage. Makes you question that rent vs. buy decision, eh? It’s the same story in California’s five other largest metros, including San Francisco (40.2% of income), San Diego (39.6% of income), San Jose (39.3%), Sacramento (29.1% of income), and Riverside (27.9% of income). To determine affordability, Zillow assumed the buyer had a 20% down payment and a 30-year fixed at Freddie Mac’s prevailing mortgage rate. These numbers are all higher relative to the income spent on the mortgage from 1985 through 2000. 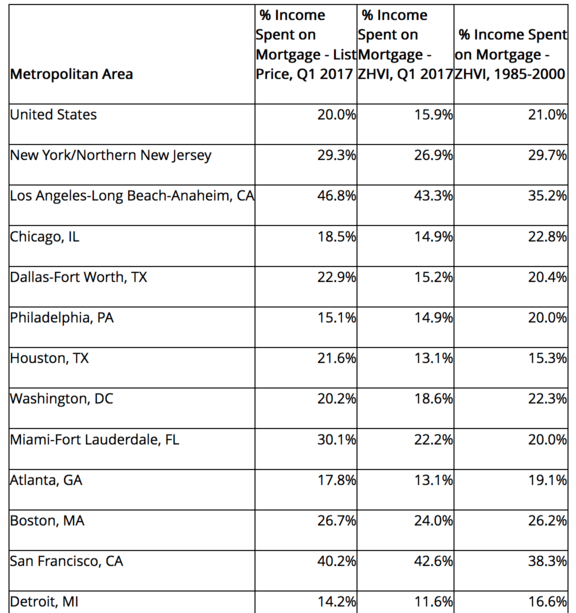 The problem is similar in many other metros nationwide aside from places like Cleveland, where homes are actually more affordable than they’ve been historically. There, the median list price of ~$144,000 requires just 12.7% of median income for monthly mortgage payments, significantly less than the 20% needed during the pre-bubble years. But Cleveland is one of the few places where it has gotten much cheaper, and remember, this is at a time when mortgage rates remain near uncharted territory. Prospective buyers still have to contend with larger down payment requirements thanks to those higher list prices, when taken together, make the prospect of owning a home dim. The only silver lining is that many lenders are now offering 1% down payments, including Quicken, and some are even rolling out zero down options like Movement Mortgage. At the same time, Fannie Mae will soon allow higher debt-to-income ratios when its Desktop Underwriter (DU) Version 10.1 is released in late July. In just over a month, DU will consider loan applications with a maximum DTI of 50%, and no longer require compensating factors for DTIs between 45-50%. Additionally, their prior DU release from last September opened the door to automated underwriting for borrowers without credit scores. Clearly we are trending toward looser underwriting guidelines after years of what many felt were excessively harsh policies. But it’s kind of worrisome given it comes at a time when home prices are eclipsing old all-time highs and mortgage rates remain dirt cheap. If buyers are still struggling to qualify with 3% mortgage rates and 1% down payments, there might be a problem lurking.